San Francisco Redevelopment Agency (SFRA) is the most corrupt and inept agency in San Francisco. It has been a long time over 10 years since the agency has been audited and it is time the Agency is audited by the City and County of San Francisco. The Agency continues to defy norms under the present lying Director Marcia Rosen. She can look you straight in the eye and lie. The Bayview Hunters Point Community has been before the SFRA Commission several times and several times the SFRA has promised the constituents that it will abide by the mandates set in the Disposition and Development Agreement (DDA) which is a legal document linked to Parcel A on Hunters Point Shipyard. Time and time again the SFRA has failed to abide by the DDA and has not taken action against Lennar Corp. and the sub contractors that continue to defy norms and harm innocent children from the Muhammad University and near by residents living in and around Kiska Road. Lennar Corp. has been buying folks left, right, and center and that includes a former Mayor and political big wigs that still have clout and work behind close doors wheeling and dealing. Among these scum bags many House Negros that are on the take the likes of Sophie Maxwell and Willie B. Kennedy. In recent months thousands of innocent folks have been exposed to particulates, lead, asbestos dust, lead, and a host of radiological elements. The Bay Area Air Quality Management, the SF Health Department, the Department of Toxic and Substances Control, the Environmental Protection Agency, Mayor Gavin Newsom, Lennar Corp. and Koffi Bonner, the Citizens Advisory Committee linked to Parcel A, the SF Redevelopment Agency Commissioners and many House Negros bought by Lennar Corp. have blood on their hands. We cannot afford to go again and again and plead before the SFRA Commission, the authorities, Mayor Gavin Newsom, Michael Cohen, Jesse Blout - give these folks the right facts and then we are forced to witness the same mistakes made - again and again as if the affected victims do not matter. In this case we are taking about innocent children that have been bombarded by pollutants for months on end. On Thursday, January 11, 2007 a Notice of Violation (NOV) was issued to the contractor to stop work and the contractor that works for Lennar Corp. The contractor continued to work and adversely affect the workers as well as the residents and the students from near by Muhammad University situated on 195 Kiska Road paying no attention to the Notice Of Violation. It has become common for the contractor to be issued Notice of Violations and for the contractor to continue working. At other times before some of us went out of our way to monitor the work - the contractor was issues Notice Of Violations but continued work when the work had to be stopped. This behavior is totally uncalled for. The SF Health Department and one Amy Brownell have cooperated and made matters worse for everyone. Had Amy Brownell who works for the SF Health Department been strict with the contractor from the inception - hundreds of innocent children and thousands of constituents living near by would not have been adversely affected. The SF Redevelopment Agency Commission hears our pleas again and again with facts and continues to allow Lennar Corp., Koffi Bonner, and others to go Scott free. This is uncalled for and some one has to be taken to task. The time has come as was decided at a previous SFRA Commission meeting to stop the work. For sure these incidents would not have happened if the project was in a White Neighborhood. This is pure Racism of the highest order and Mayor Gavin Newsom is not doing what preaches. Gavin Newsom has not helped the constituents of Bayview Hunters Point and these incidents where our children are exposed to dangerous pollutants and toxic elements speak to the fact. This is pure Racism of the highest order and those that do not do anything about the sad state of affairs have blood on their hands. 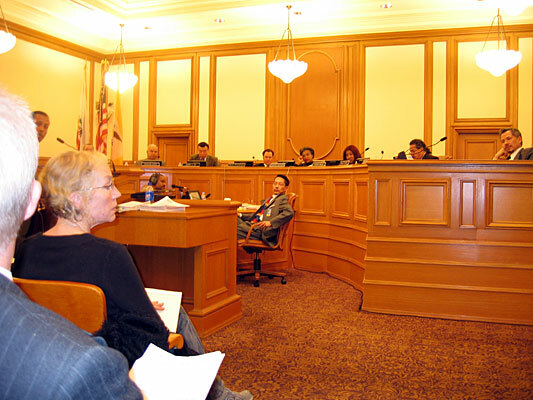 At yesterday SFRA Commission meeting held January 16, 2007 in Room 416 at City Hall - again the SFRA Commissioners were slow to stop the project on Parcel A.
Lennar Corp. has spread so much money and has destroyed the conscience of the folks that should be doing their jobs. Mayor Gavin Newsom looks away from this situation; Marsha Rosen looks away, House Negros look away - while all the time our children are dying. Welcome to San Francisco and the Bayview Hunters Point.